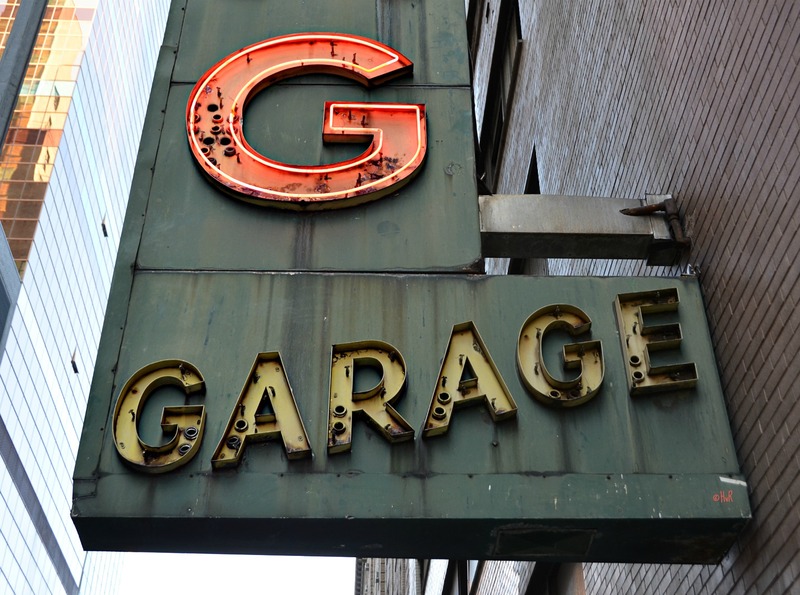 Photo of the day: ‘G’ IS FOR GARAGE – Finding an available parking space on the streets of New York City can be a frustrating and time-consuming endeavor. Even if you luck into a space, confusing signs and malfunctioning meters can lead to expensive parking tickets, if the lousy new muni-meters aren’t working they can negate a whole block. It’s no wonder that so many New York drivers rely on parking garages. Parking in a garage will cost you more than parking on the street, but will also save you time and headaches when you’re in a hurry. According to Park It! NYC 2009, a directory of Manhattan parking garages, there are 103,000 licensed, off-street parking spaces in Manhattan. New York parking garages range from the tiny (the one at 324 W. 11th St. has just 7 spaces) to the enormous (the garage at Pier 40 has 3,500 spaces). But how much are you wiling to pay for this privileged space? In Manhattan it can cost as much as an additional room to your apartment. The most expensive parking space in Manhattan is located as part of a private townhouse at 66 East 11th Street for the annual rate of $1 million dollars a year! There are cheaper spaces – at the 2nd most expensive garage in NYC at the GM Building, 767 Fifth Avenue/59th Street where the rate is only $66. a day = $1,320 per month! This entry was posted on June 20, 2013 by newyorkcityinthewitofaneye. It was filed under DAILY PHOTOS WITH STORIES OF NEW YORK CITY and was tagged with $ 1 million parking space, 66 East 11th Street, expensive parking, garage, GM Building, hourly parking rates, Manhattan, most expensive parking spaces in New York, Muni meters, neon signs, New York City, New York photo, Park It! NYC 2009, parking garages, Photo of the day.